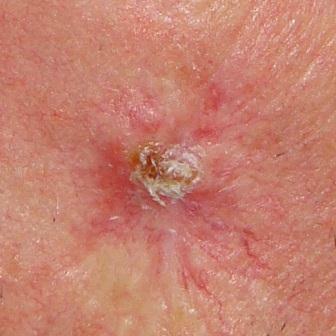 Squamous cell carcinoma (SCC) is a type of skin cancer. It arises from keratinocytes (a particular type of cell) in the skin. It is a malignant condition that has the potential to spread around the body. Luckily if caught early the condition is usually fully treated with surgery. What is SCC in situ (Bowen’s disease)? 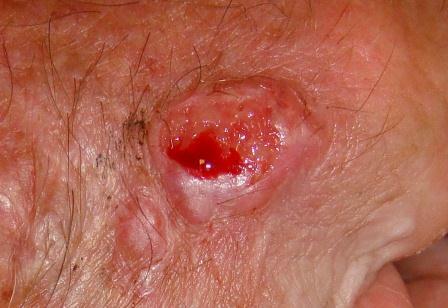 Squamous cell carcinoma in situ (SCC in situ, Bowen’s disease) is an early form of SCC that is yet to invade to the dermal layer of the skin. It is a pre-malignant condition, which means that SCC in situ is a tumour that has not yet developed the capacity to spread. In some instances SCC in situ can be successfully treated with 5-fluorouracil cream; it can also be treated surgically. Speak with your surgeon about what treatment options are most appropriate in your individual circumstances. 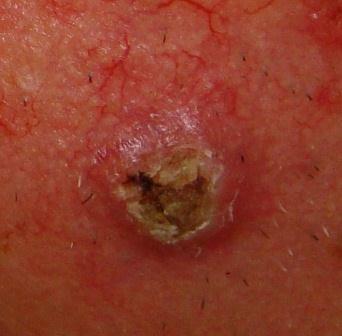 A keratoacanthoma is thought to be a “good” or "favourable" version of a squamous cell carcinoma. They tend to grow rapidly and are indistinguishable from a SCC when you look at them on the skin. Because they are indistinguishable from a rapidly growing SCC the recommended treatment is to have them excised and the tissue examined by a pathologist. Only then can the correct diagnosis be made. If left alone a true keratoacanthoma will regress after it goes through its rapid growth phase, but it may leave a visible scar (which remains even after the anxiety about the uncertainty of the diagnosis settles). 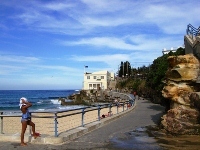 SCCs are commonly raised and scaly. However, they can have variable appearances – they may instead look like an ulcer. Other tumours like a keratoacanthoma, SCC in situ or basal cell cancer may be indistinguishable from an SCC when examined on the skin. Some people have considerable sun damage and have a variety of scaly patches of skin (called "solar keratosis" or "actinic keratosis"). 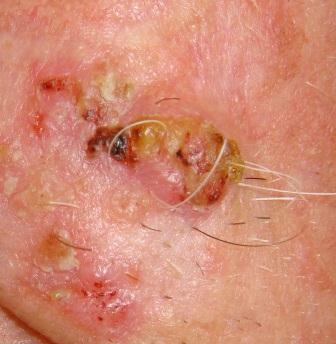 In this instance a worrying sign is a rapid or progressive change in the size of a scaly raised patch, or if the patch becomes sore, inflamed or red. The majority of favourable SCCs can be excised with a margin of 4mm or more, which gives a very high chance of achieving complete clearance. If the pathology results show that the microscopic margin is less than 1mm your surgeon will usually recommend further excision to reduce the risk of recurrence. If you have an aggressive type of SCC a larger margin of surrounding skin is usually excised. The prognosis is best for SCCs that are small, well defined, excised early, excised completely and not invading nerves or other structures. In some instances treatment can be performed through curettage or dry ice. These are valuable treatment methods, especially in people who regularly develop new skin lesions. A downside of this type of treatment is that you cannot be sure if the SCC has been completely removed. If a SCC recurs after curettage or dry ice it is sensible to have it excised surgically, so that a pathologist can examine the specimen and confirm whether the SCC has been completely removed. During your recovery you should keep your hand elevated higher than your heart to reduce swelling and keep your dressings dry and intact. A sling may be helpful in keeping your hand elevated. The surgery is not usually particularly painful and usually over the counter medications such as paracetamol and/or ibuprofen will be sufficient to keep you comfortable. Your surgeon may place a splint on your hand to reduce movement during the healing stage, to prevent you stretching out the wound in the first 1-2 weeks. Your surgeon will usually be able to predict this before the operation so you can plan how much time off work or how much assistance at home you will need. Can I use an anti-cancer cream? An anti-cancer cream with the active ingredient of 5-fluorouracil is effective in treating SCC in situ, but is not recommended for the treatment of squamous cell carcinoma. If you are treating an SCC in situ with 5-fluorouracil cream and it is not getting better I would suspect that it has progressed to be a SCC (progressed from a pre-malignant tumour to a malignant cancer). Spread to lymph nodes occurs in around 2-5% of people and is more likely to happen in people with larger skin cancers, inadequate excisions, multiple recurrences and a variety of specific pathological features (in SCCs that look “bad” under the microscope). 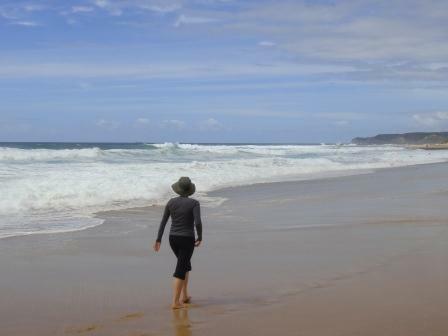 If you have symptoms or signs to suggest that your skin cancer has spread to the lymph nodes this will need to be investigated and treated. Your surgeon will be able to advise you about this. The main risk factors for the development of squamous cell carcinoma are chronic exposure to UV light and immunosuppression. It is unusual to need radiotherapy for a simple SCC – radiotherapy (and, to a lesser extent, chemotherapy) is generally reserved as an additional treatment for very extensive skin cancers that have spread to the lymph nodes or have invaded deep structures (like bone or muscle). You will have post op visits scheduled to learn the pathology results, check the wound, remove any non-dissolving sutures, receive advice about scar management and answer any questions you have. Sutures on the hand and fingers are usually removed after 10-14 days. After the wound is healed you will also have follow-up visits scheduled to check for recurrence of the SCC. The frequency and duration of these follow-up visits will depend on multiple factors including your pathology results, how far away you live from your surgeon and whether your GP is happy to be involved in the follow-up.